With less than 950 residents, Green River is no metropolis. As we turned off Interstate 70 to head south, the only structures in sight were a couple of gas stations and a few houses. I wondered where the other 940 residents were hiding. From Green River we drove about 30 miles south on dirt roads before reaching the Horseshoe Canyon trailhead. Various unmarked roads interconnected like a spider web. Without directions, it would be easy to end up in the wrong place. Our pickup trucks handled the roads just fine, but we had good weather. A few segments of deep, powdery clay looked like they’d get pretty nasty with some rain. Even dry, the talc-like dirt almost trapped our vehicles in a couple of places. Horseshoe Canyon is part of a detached unit of Canyonlands National Park. It was added in 1971 to protect the uniquely aesthetic rock art found on the canyon walls. Around 2000 years ago Horseshoe Canyon and the surrounding areas were inhabited by the Archaic people, a nomadic group of hunters and gatherers. They left little behind, save for ghostly images scattered across the walls of Horseshoe Canyon. 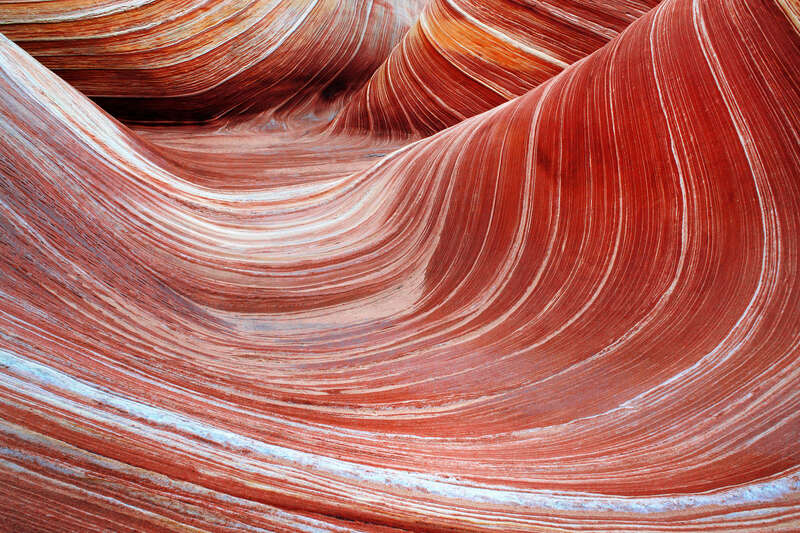 Their artwork is referred to as the Barrier Canyon style. Barrier Canyon rock art is characterized by large, often armless figures with bug-like eyes and patterned embellishments. The examples found in Horseshoe Canyon are considered some of the best in the Southwest. The hike was not difficult, but I was glad for cool weather. Temperatures can be miserably hot in the summer. Another benefit of our winter-time visit was the surprising absence of other visitors. Isolation intensified the canyon’s haunting atmosphere. An intermittent stream named Barrier Creek runs down the bottom of Horseshoe Canyon. Flash flood danger is low, but I wouldn’t want to get caught down there during a big rainstorm. Flood-debris was piled head-high against tree trunks. A few stretches of the creek had frozen over, and the ice provided a welcome solid surface to walk upon. 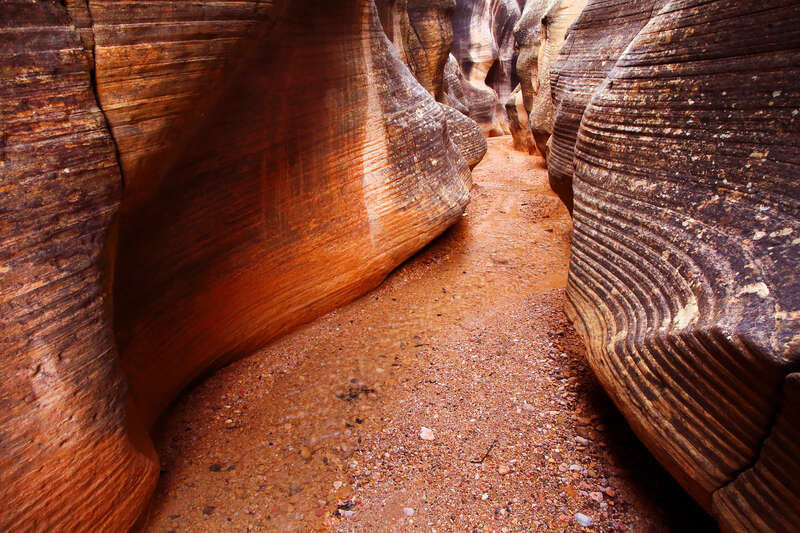 A fine, gritty sand comprising the rest of the canyon floor made for a taxing hike. Hiking on the ice seemed like a great idea, until three of our four group members punched through into thigh-deep ice water. We also found a healthy amount of quicksand, which proved fascinating enough to preoccupy us for an hour or two. Several inches of dry earth had crusted over the quicksand underneath, so at first glance it appeared to be solid riverbed. The crust was just strong enough to support our weight. The experience was something like walking on a giant waterbed. A little stomping and kneading was enough to re-liquify the quicksand. After satisfying our curiosity and moving on, we finally arrived at the great gallery, home to Horseshoe Canyon’s largest pictographs. I must admit, they were pretty impressive. The most imposing figure in the group measures about eight feet from head to toe. From there, we hiked a few more miles to the confluence of Bluejohn Canyon, the slot made infamous by Aaron Ralston. There’s something about these canyons that keeps drawing you further in, almost against your will. We couldn’t resist the temptation to explore. 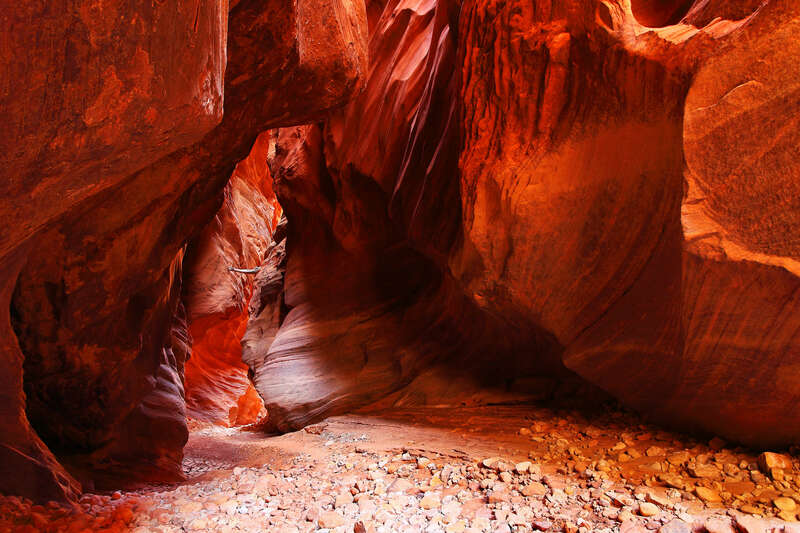 Upon entering Bluejohn, the canyon walls quickly draw inwards and upwards. Unfortunately the sun was dipping low in the horizon. We decided to turn around before getting far enough to peer into upper Bluejohn, the stretch of canyon that had claimed Aaron Ralston’s right arm a few years earlier. With daylight failing, we began the sandy slog back to the trailhead.